Being very short of time this week [been busy making video tutorials! ;) ] has forced me to think of ways to create a card quickly. For this one, I combined a simple background with a silhouette and then used layers of cardstock and paper to give it a lift. I used the English Garden Designer Series Paper with Pumpkin Pie and Mossy Meadow cardstock for the layers. For the background: I inked the Watercolour Wash background stamp with Pear Pizzazz and Pumpkin Pie inks and spritzed water onto a piece of Shimmery White cardstock before stamping onto it. I let the colours run a bit and then dried it with my heat tool. 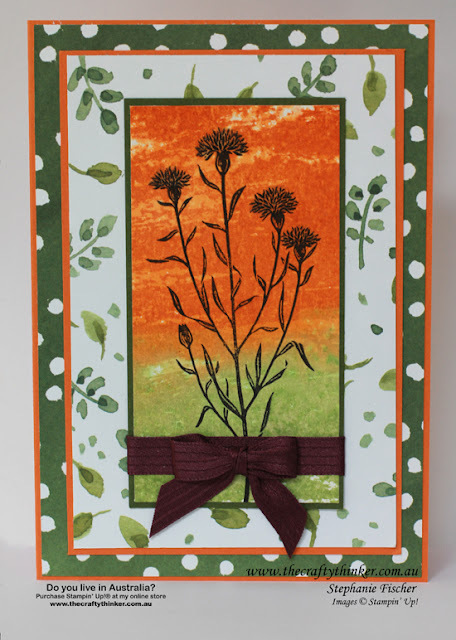 Once the background was dry I used Archival Black ink and the Wild About Flowers stamp set (another generous gift for advancing to Silver - thank you again, Kylie Bertucci!). It's a two-step stamp set but oh so quick and simple to do! I added some Blackberry Bliss ribbon for good measure - this particular version is retired now (I don't use my ribbon fast enough!) but some of the Rich Razzleberry Cotton Ribbon would have done the trick if I'd had some. If you'd like to make a purchase in my online store, click on one of the product images below.